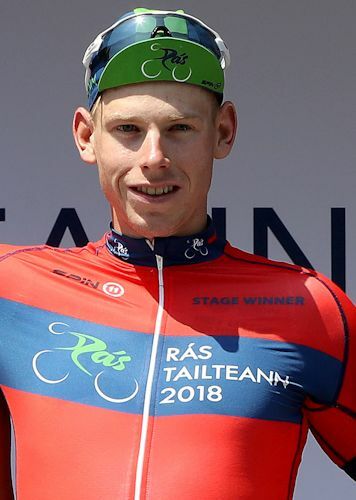 He went close on stage three, taking second into Listowel; things worked out perfectly for German competitor Lucas Carstensen on Thursday’s fifth stage of the Rás Tailteann, with victory into Mitchelstown. The Germany Bike Aide rider was best on the uphill rise to the line, beating Robbe Ghys (Belgian National Team), Jason van Dalen (Netherlands Delta Cycling X), best county stage rider Matteo Cigala (Westmeath Viner-Caremark - Pactimo) and the rest of an 83-man main bunch. Fintan Ryan (Cycling Leinster) was best Irishman in tenth, one place ahead of Kerry Killarney’s Richard Maes. “My team brought me to the front in the last five kilometres,” said Carstensen shortly after the sprint. “I think at three kilometres there was crash, maybe at position 40. I just heard it from the back. And then in the last kilometre two of my teammates brought me to the front on the second-last corner. I think then there was a gap behind me. The 150 kilometre stage was much flatter than stage 4. It began in Glengarriff and crossed three climbs en route to Mitchelstown. The first two were category two ascents at the Pass of Keimaneigh (km 25) and Gortnabinna (km 37.7), with the third being the category three climb of Kildorrey (km 137.9), just 12.1 kilometres from the finish. The day’s break comprised stage two winner Robert-Jon McCarthy (Ireland National Team), Seid Lizde (Ireland Holdsworth Pro Racing Team), Joe Evans (Britain Saint Piran Elite Cycling Team) and Matthew Nowell (Britain Canyon Eisberg). They built a maximum advantage of just under three minutes. Evans had started the day two minutes and 37 seconds back and became race leader on the road, but eventually slipped back when the pace increased near the finish. The other three pressed on, with McCarthy the last to be caught inside two kilometres to go. “Our plan was to be aggressive, definitely. And in this race you can’t really sit back and wait too much. Ideally more guys would have been in the break than only four. It might have gone the distance if there were another couple of teams represented. But the time you are in the break, it is hard to drop back out. So we just had to give it everything. His ride showed a good recovery after a crash on stage four. While he said he is still stiff from his injuries and consequently doesn’t know how he would have fared if he waited for a sprint, he believes there will be more chances in the days ahead. Overnight race leader Cyrille Thiery (Switzerland National Team) finished 16th on the stage and defends his yellow jersey. He remains ten seconds clear of Luuc Bugter (Netherlands Delta Cycling X) and 11 ahead of Damien Shaw (Ireland Holdsworth Pro Racing Team), the best Irish rider. Robbe Ghys (Belgian National Team) is 13 seconds back, two more than Benjamin Wolfe (USA Jelly Belly P/B Maxxis). Ronan McLaughlin is ninth overall, 35 seconds back, and continues as the best county rider. Bugter (Netherlands Delta Cycling X) continues to lead the points classification, Lukas Ruegg (Switzerland National Team) maintains his lead in the King of the Mountains classification and Robbe Ghys (Belgian National Team) is the best young rider. 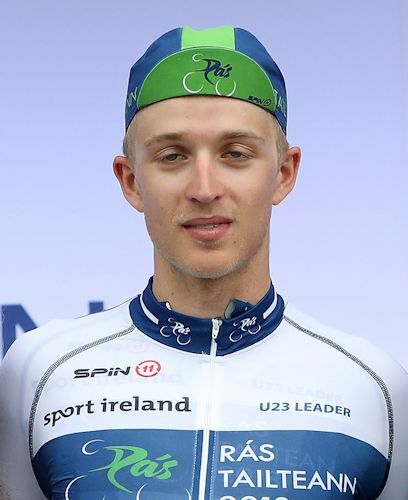 Raymond Cullen (Tipperary Panduit) is the category two leader, the Switzerland National Team is the best team, and Westmeath Viner – Caremark – Pactimo is dominating the best Irish county team classification. 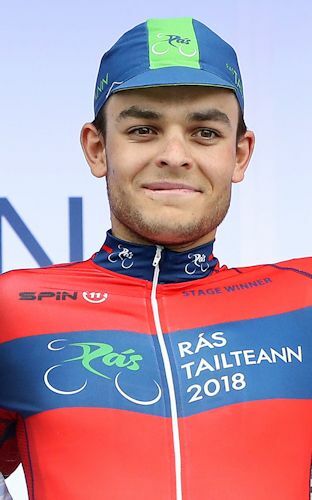 The fifth stage of the Rás Tailteann was a much flatter affair than stage four, with just three climbs rearing up along the 150.2 kilometre race from Glengarriff to Mitchelstown. These were the category two ascents of the Pass of Keimaneigh (km 25) and Gortnabinna (km 37.7), and then after 110 kilometres of mainly flat roads, the category three climb of Kildorrey (km 137.9). That left 15 kilometres of flat to rolling roads between there and the finish. After beginning the stage in Glengarriff in sunny conditions, there was a steady stream of attacks. The move of the day went after 12 kilometres, with stage two winner Robert-Jon McCarthy (Ireland National Team) showing he had recovered from his big crash on Thursday to go clear. He was joined by Seid Lizde (Ireland Holdsworth Pro Racing Team) and Joe Evans (Britain Saint Piran Elite Cycling Team), with Matthew Nowell (Britain Canyon Eisberg) getting across soon afterwards. The quartet had a minute’s advantage over the peloton after 20 kilometres of racing, and this continued to grow on the category two Pass of Keimaneigh (km 25): Evans was first to the top there, ahead of Nowell, McCarthy and Lizde, with Daniel Coombe (Wales Racing Academy - National Team) and Taylor Shelden (USA Jelly Belly P/B Maxxis) the best of those behind. The gap rose to two minutes and ten seconds by the start of the second climb, Gortnabinna (km 37.7), where Nowell took the prime ahead of McCarthy, Lizde and Evans. Back in the peloton, Maximilian Stedman (Britain Canyon Eisberg) and king of the mountains leader Lukas Ruegg (Switzerland National Team) were fifth and sixth. The gap dropped to one minute and 18 seconds by the 69 kilometre point, but it rose again to two minutes and 20 over the next ten kilometres. The gain continued by Rathcoole, (km 84.8), where it reached two minutes and 40 seconds and made Evans race leader on the road. The drift upwards continued at Banteer, (km 91.7), where it was two minutes 50, and Mallow (km 111.9), where it was two minutes 55. Motivated by the thoughts of yellow, Evans was doing a lot of work. This extracted a toll on him and after 118 kilometres of racing, he started to weaken and looked like he might be dropped. Seven kilometres later he sat up and went back, leaving three out front. Around this time Taylor Shelden (USA Jelly Belly P/B Maxxis) attacked from the peloton. He was one minute 25 back around kilometre 127, with the peloton ten seconds further back. He held on to take fourth on the day’s final climb, the category three climb of Kildorrey (km 137.9), which was won by Nowell ahead of McCarthy and Lizde. However Shelden was caught right after the summit, at which point the peloton was just over a minute behind the break. With ten kilometres to go, the gap was down to 48 seconds. With five kilometres left, it was 24 seconds. McCarthy was the last to resist, but he was caught inside two kilometres to go. A big bunch sprint ensued on the slight uphill rise to the line, with Carstensen (Germany Bike Aid) proving best. The 154.6 kilometre stage from Mitchelstown to Carlow has no less than five climbs inside the final 50 kilometres, including first category Gorteen and then the second category Coan West and Clongrennan ascents. It’s very possible that the bunch will break up and a big battle will play out for both the general classification and the stage win.